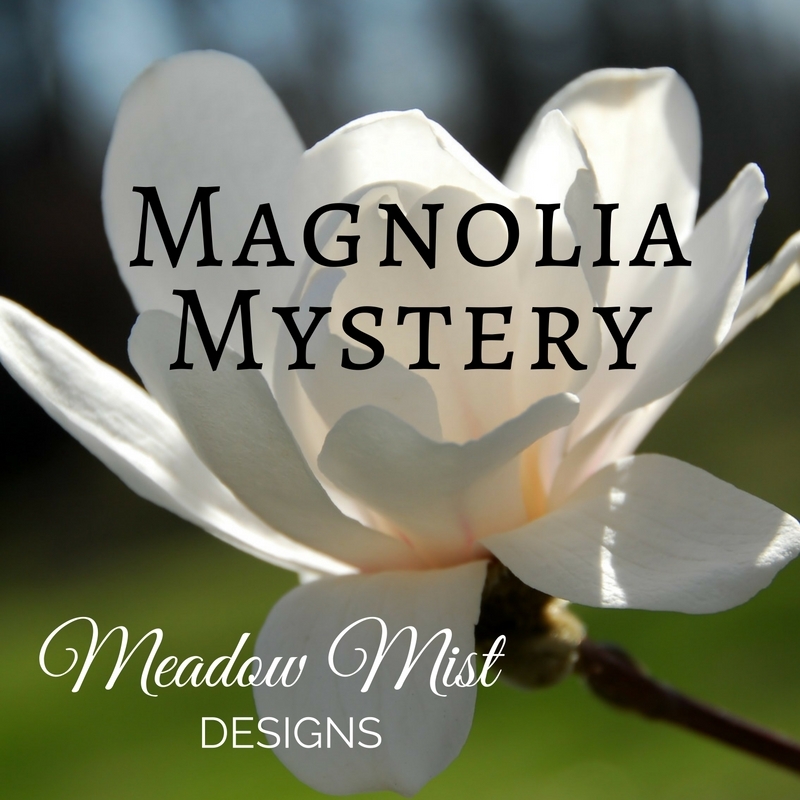 I am very excited to announce that the next mystery quilt, the Magnolia Mystery Quilt will begin in a little over two months on July 6th! The Magnolia Mystery Quilt is a free quilt-along that will run from July 2017 until February 2018 with a set of directions revealed the first Thursday of every month. New for this quilt along...there will instructions for two quilt sizes, a lap sized quilt and a queen sized quilt. We will kick off the quilt-along in July with the fabric requirements and some helpful hints to pick fabrics and colors (you will have an entire month to gather fabrics before the cutting instructions in August). The monthly instructions will be posted to this blog as blog posts (and can always be found in the Mystery Quilt tab above). Instead of having to sign up for e-mail list to have the pdf's e-mailed to you (like in the previous mystery quilts), I will be attaching a link to the downloadable, easy to print, pdf versions of the instructions right into each monthly instruction blog post. I will be posting in June more about the downloadable files so that everyone can easily get the files. I have made a button for the mystery quilt :) If you decide to join in on the quilt-along and have a blog I would love it if you posted the button. We will have prizes! Prizes will be given out randomly to quilters who submit finished quilts or quilt tops to the reveal parade in February 2018. I am working with sponsors to finalize the prizes and will be posting more about the sponsors and prizes as the start date to the mystery quilt approaches. Want to join in the fun but making a mystery quilt is not your thing? If you would like to see the final pattern to decide whether to join in, or to help pick colors; simply e-mail me at (MMDmysteryquilts at gmail dot com) and I will send you a sneak peak (the only rule is that you have to keep the design completely to yourself as to not spoil anyone else's surprise). We have close to 2,000 members in our Facebook Group (Meadow Mist Designs Facebook Group) sewing together! Join the group today so you can share and see everyone else's fabric, progress pictures, and finished quilts. The instructions for my previous mystery quilts are located in the (totally revamped) Mystery Quilt tab above (and are always available so you can start them at any time). All patterns are also available as downloadable digital pdf files from my Etsy shop for those that would prefer a single, easy to print versions of the patterns. I think that is everything for now. I hope that you are planning on joining me for a fun mystery quilt! If you have any questions you can leave them in a comment below or e-mail me at MMDmysteryquilts@gmail.com, I look forward to quilting along with you! Can't wait. Love your mystery quilts. I am so looking forward to this one. My schedule wouldn't allow me to join in on the last one. I did follow along and I liked the pace that you set for each step. Thanks. Woohoo! I'm seriously considering it this year, but I'll probably be starting late. Sounds lovely! Magnolia is such a southern thing! Are yours blooming yet this year? How awesome to be ops close to over 2,000 subscribers! I am already excited for the next mystery to start!! I can't wait for July! Can't wait for July!!! Magnolia's were my mothers favorite flower. My father-in-law also had two huge Magnolia trees. We always had them in our homes, the leaves, the buds, and the flowers when they were blooming. I even painted them for all of us so when not in bloom we had them on our walls. I will enjoy making this as every time I hear Magnolia it always brings back great memories of a families favorite flower. Thank you so much for your beautiful patterns. Yay, love your quilt a longs. Lovely flower photo for inspiration too! Just saw this and very excited to try this mystery quilt that will start on July 6 as that is my birthday. So now I have a chance to do a quilt for myself. Thanks. I am looking forward to your new Magnolia Mystery Quilt-Along! New to here and Magnolias are my favorite thing. May need to email as I've never done a mystery quilt before. Sounds like fun! Sounds like more fun ahead! Can't wait!!! I love the surprise of the pattern! so so excited about another mystery.... this is my 2nd and I am THRILLED to have found you! YAY!! I plan on going back and doing the previous mysteries... just because ! I'm looking forward to starting your next mystery. The last two have been so much fun. Thank you for all the effort you put into these mysteries. Meadow Mystery Quilt - Winners!